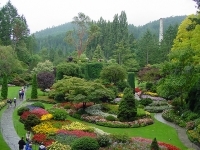 With well over a million visitors a year, the hundred-year-old Butchart Gardens remain a favourite and one of Vancouver Island's principal attractions. Situated about 14 miles (21km) north of Victoria, the gardens were begun in the early 1900s by Jennie Butchart in an abandoned limestone quarry owned by the family. Their fame soon spread and attracted thousands. 55 acres are open to the public to be explored and visitors can wander the paths through exquisitely laid out gardens, including the Sunken Garden (the original garden started in the quarry), a Japanese Garden, Rose Garden, and Italian Garden. Spring and autumn are perhaps the best times to visit: the gardens become a riot of colour, although winter and summer hold their own delights. Every Saturday, from the beginning of July to the end of September, the Gardens are transformed by a dazzling fireworks show, as well as a recital on the self-playing, rare Aeolian Pipe Organ and the Night Illuminations light display. Other attractions and events in the park include an ice-skating rink and Twelve Days of Christmas display in December, and afternoon and evening shows and concerts in summer. Opening times and admission costs vary according to season so check the official website listed below for details. Admission: Vary according to season.